IT WAS a tour displaying the Rose City's heritage, but Plumb's Chambers – including number 82 Fitzroy St, arguably the oldest shop in Queensland – was not given visiting rights. A series of bus tours took visitors across Warwick to admire our heritage buildings yesterday as part of the 150th birthday celebrations. But with safety upgrades to the buildings and a legal challenge to demolish most of the site in limbo, visitors were left disappointed at just a drive by the orange mesh-draped Plumb's Chambers. 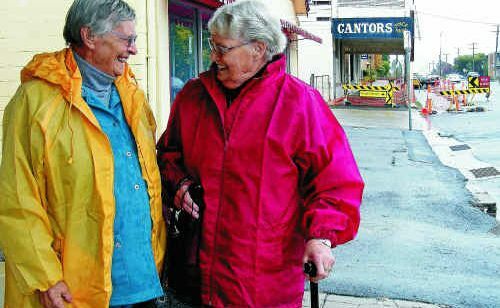 Having moved to Warwick just 12 months ago, sisters Susannah Mutton and Phyllis Findley were keen to discover more about the local history. The pair enjoyed the heritage tour and said while they understood how much money was involved in restorations, they would like to see Plumb's Chambers live on. “It's a shame a lot of the old buildings go to wrack and ruin,” Mrs Mutton said. Mrs Findley said it was important to help keep the area's historic monuments. “You need an awful lot of money to keep these places, but it's important,” she said. The tours' hosts, Elva Sinclair and Greg Ziser, said they had had further feedback from the busloads. Mrs Sinclair said there were a lot of people – mainly from Warwick – who thought Plumb's should be preserved. “They're important to Warwick. They were the first two commercial businesses in town,” Mrs Sinclair said. Mr Ziser had similar feedback, who said it was a shame for it to have been let go. He said it was a matter of enthusiasm to get Plumb's Chambers back to its original grandeur. “It's certainly very disappointing with something of that age and historical importance – and the fact something that is heritage-listed could be demolished even with a listing on it,” Mr Ziser said. Mr Ziser took the buses past Scots PGC College, where the visitors admired the chapel which was reconstructed by McConaghy Group which own Plumb's, which cost more than $2 million to relocate piece by piece. The chapel originally stood on the site of Rose City Shoppingworld, with Plumb's Chambers now the hurdle to a planned centre expansion by the McConaghy Group. Canning Downs owner John Barnes is behind an ongoing court appeal against demolition of number 82 Fitzroy St and the rear section of 84 next door. Haig Avenue into the centre remains closed due to safety concerns yet to be addressed at number 84.